Astronauts Al Drew and Stephen Bowen are suiting up for a planned six-and-a-half-hour spacewalk to install a backup power cable between two space station modules, move a failed ammonia pump to an insulated enclosure and to perform a variety of maintenance tasks outside the orbiting lab complex. They also plan to capture a sample of the vacuum of space for a Japanese educational project called "Message in a Bottle." Floating in the International Space Station's Quest airlock module, Bowen and Drew plan to switch their spacesuits to battery power at 11:18 a.m. EST (GMT-5) to officially begin the first of two planned excursions. This will be the 154th spacewalk devoted to station assembly and maintenance since construction began in 1998, the third so far this year, the sixth for Bowen and the first for Drew. Going into today's spacewalk, U.S., Russian, European, Japanese and Canadian astronauts had logged 961 hours and five minutes of EVA time -- 40 days -- building and maintaining the station. For identification, Bowen, call sign EV-1, will be wearing a suit with red stripes while Drew, call sign EV-2, will be wearing an unmarked suit. Bowen is a late addition to Discovery's mission, joining the crew in January after lead spacewalker Timothy Kopra was injured in a bicycle accident near his home in Houston. With only a few weeks to train, Bowen and Drew completed two full-scale dress rehearsals in NASA's giant training pool near the Johnson Space Center and reviewed procedures in the agency's virtual reality laboratory. While he received much less mission-specific training than a typical spacewalker, Bowen is a veteran of five previous EVAs and he flew on the most recent previous shuttle mission last May. "Obviously, there are a lot of things I don't know that I'm trying to catch up (on)," he told a reporter Sunday. "But these guys have been training together for so long and they know this mission so well, they've been able to pick up the slack that I've kind of brought on board and they've got me covered pretty well." "Plus, they put together these EVAs so well, the choreography is so clean, Tim and Al did such a fantastic job, as well as the guys on the ground." Kopra will be in mission control at the Johnson Space Center during both of the Discovery crew's spacewalks to provide insights and advice as needed. "We were all really sorry to hear that Tim Kopra, after his bike accident, he was not going to be able to fly," said space station Flight Director Chris Edelen. "However, the transition to Steve Bowen has been very smooth, Steve's got a lot of experience, he's done five spacewalks and in fact, he flew on the last shuttle mission back in May. 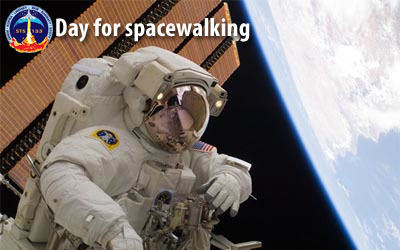 And he was involved with the development of spacewalks for this flight. "So he's perfectly suited to pick up the role. He did two practice runs for the spacewalks in the neutral buoyancy lab here in Houston, that's the large swimming pool with a mockup of the space station, so they did one dive for each of the planned spacewalks on this flight and some additional proficiency training and Steve's ready to go." The crew's first spacewalk has two primary objectives: installation of an extension cord that must be in place before a new module is attached Tuesday; and work to move a failed 800-pound ammonia pump module that was left in a temporary location after three cooling system repair spacewalks last summer. After exiting the airlock, Bowen and Drew will make their way to the Earth-facing side of the central Unity module where a new storage module, brought up aboard Discovery, will be attached Tuesday. The J612 extension cable will route backup power to the Tranquility module, also known as Node 3, that is attached to Unity's left-side port. After the new Permanent Multipurpose Module, or PMM, is attached to Unity's Earth-side port, a critical heat exchanger in Tranquility will no longer be accessible for repairs if a failure occurs. The only way to fix it would be for the station's robot arm to pull the module away from Unity so spacewalking astronauts could install a replacement. The J612 cable will provide backup power to Tranquility if such a repair is ever required. "Just think of it as an extension cable in space," said Edelen. "There's an electrical socket on the bottom side of the (Unity) module. That socket cannot be reached once the Permanent Multipurpose Module is installed. So before we install it, we have to plug in this extension cable into the J612 connector, or socket. Then the extension cable will be hooked up to an existing cable that's already providing power to some of the airlock shell heaters. Once we get all this hooked up, the path will be cleared for installing the PMM." With the J612 cable in place, Bowen and Drew will split up. Bowen will move up to the front of the station's solar power truss where the failed pump module is mounted on the mobile base used to transport the station's robot arm to various work sites. The pump module failed last summer, knocking out one of the station's two cooling loops. It took the lab crew three spacewalks to remove the failed unit from the power truss and install a replacement. Because the work took longer than expected, the astronauts did not have time to move the old pump back to its normal storage location on a platform mounted on the Quest airlock. Bowen, riding on the end of the station's robot arm, will carry the pump module to a tent-like insulated housing on External Stowage Platform No. 2 -- ESP-2 -- where the spare module that replaced it was originally mounted. Drew, meanwhile, will work to install an ammonia vent tool at the storage platform that will be used during the crew's second spacewalk Wednesday to release any ammonia that's still trapped in the pump. If all goes well, the pump will be returned to Earth aboard the shuttle Atlantis during NASA's final planned shuttle flight this summer. "Several months ago we had an ammonia pump for our cooling system fail on board the space station and we needed to go and replace it," Drew said in a NASA interview. "That task is very long and involved and they got the new pump in place. They got the space station in a configuration where it could sustain itself, but the old pump needed to be put away and a lot of the tools and things that were out there had to be put away, too, and next opportunity to do that was going to be during our spacewalk. "So we will start right off with going out to pick up that failed pump and putting it back in the storage location for the replacement pump. It's got a big tent that it goes into and we'll put it in there and bolt it down." With the pump module safely stowed, Bowen and Drew plan to carry out a variety of maintenance tasks, adjusting insulation on a component in the upper Z1 truss, attaching a tool stanchion and putting a wedge in place to tilt a camera away from a newly installed equipment carrier. The wedge is needed to provide additional clearance when hardware delivered aboard a Japanese cargo ship is attached later. Before ending the spacewalk, Bowen and Drew will open a Japanese container and "fill" it with the vacuum of space in a project for the Japan Aerospace Exploration Agency calls "Message in a Bottle." According to NASA, the project is part of an on-going effort by the Japanese space agency to "create multimedia products and artistic works that inspire the general public." "We're simply going to open this bottle up and get a sample of the vacuum of space," Drew said. "It's a big thermos bottle and we open it up and allow it to equalize with the vacuum of space out there and then we seal it back up. ... We'll get some photographs for the Japanese Space Agency and we'll bring that in and that would wrap up our first spacewalk." 05:03 PM...04...00...10...00...EVA-1: Japan "Message in a Bottle"